Sir Ian Godfrey Bosville Macdonald of Sleat, Bt. 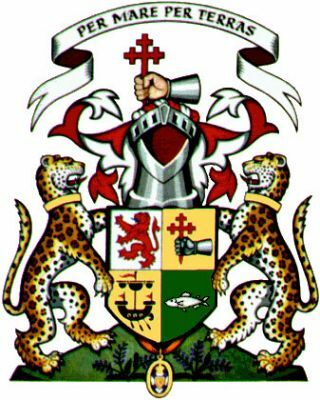 Arms: Quarterly first, Argent a lion rampant Gules armed and langued Azure; second, Or a hand in armour fessways Proper holding a cross crosslet fitchee Gules; third, Or a lymphad sails furled and oars in action Sable flagged Gules; fourth, Vert a salmon naiant in fess Proper. Supporters: two leopards Proper collared Or. Matriculated: The Courtof the Lord Lyon, 6th January 2000. Register; Volume 80, page67.